To call a film noir cynical is to be a bit redundant. 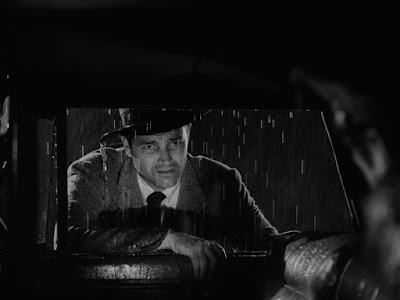 To call it cynical even for a film noir--well, you know then you have something truly acidic on your hands. Such is Edgar G. Ulmer’s 1945 sweatbox Detour, the first ever B-movie inducted into the National Film Registry. At a scant 69 minutes, it’s a feverish thriller, its characters always in motion. Even when they are physically stuck in place, their minds are still moving, each player considering the next exit. It’s breathless and exhilarating and a little bit hateful. But you’ll love how hateful. Tom Neal stars as Al Roberts, a juke joint piano player in love with an actress (Claudia Drake) who has left him stranded in New York to make a go at becoming a star in Hollywood. Fed up with being alone and, let’s face it, both jealous and horny, Roberts starts hitching across the country to see her. In Arizona, his luck seems to turn when he is picked up by Charles Haskell (Edmund MacDonald), a sleaze-ball gambler who is willing to take him all the way to the City of Angels. Ulmer and writer Martin Goldsmith (The Narrow Margin) make no bones about what a dirty guy Haskell is. When Roberts asks him about the fresh scratches on his arms and hands, Haskell tells him they came from a lady hitchhiker who didn’t show her gratitude in the way her benefactor would have liked. 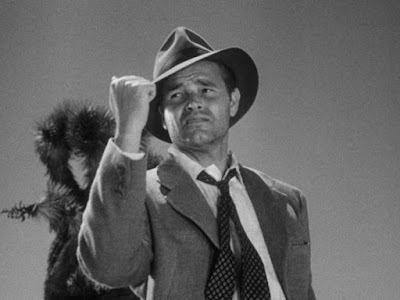 “I was tussling with the most dangerous animal in the world, a woman!” he says, before reminding us that any woman who would hitchhike is pretty much asking for it anyway. Fate comes up a lot in Detour. 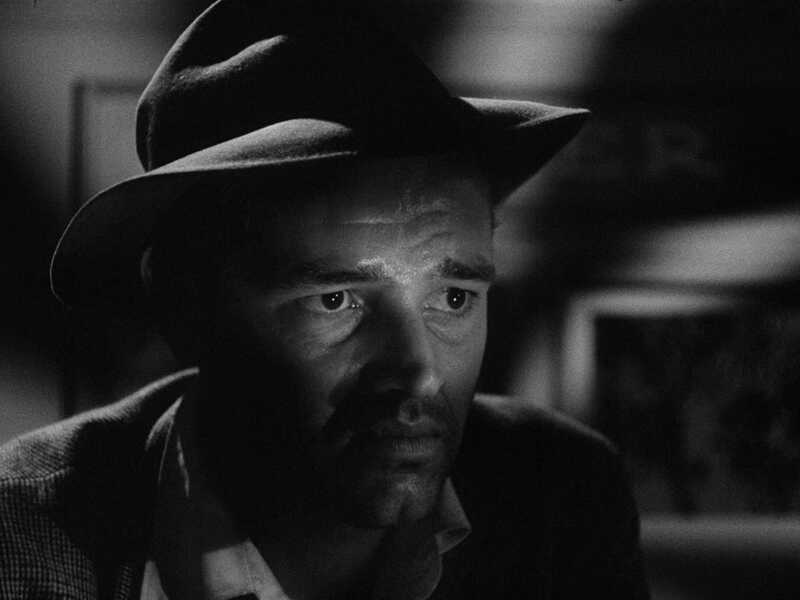 It’s a common noir trope: man can’t outrun his past, nor can he change his destiny. Because we have made our past, and we are our own destiny. You know the cliché: wherever you go, there you are. So when Roberts’ dame runs off chasing her imagined destiny, he must try to alter his trajectory. Likewise, Haskell has lost his fortune on the ponies in Miami, and now he’s looking to shake his own bad luck loose. Yet twists of fate means each will get their comeuppance. First, a random accident causes Haskell to end up dead, and a panicky Roberts leaves him in the middle of the desert and assumes his identity. 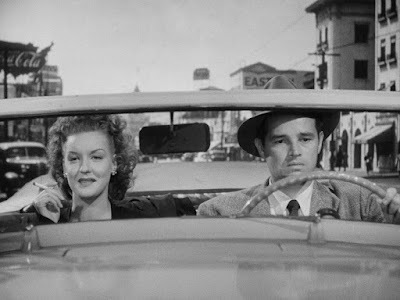 Second, instant karma means Roberts picks up Vera (Ann Savage), the very woman that left those scars on the dead man. Knowing that Roberts isn’t who he says he is, Vera blackmails him. He’ll take her into L.A., sell the car, and give her the money, or she’ll make sure he’s sent down for the killing, innocence and circumstance be damned. And he can’t leave her until she’s satisfied. Possibly because she’s a little bit lonely, possibly because she’s just plain mean. Not to mention her plans keep shifting the more opportunities she sees. When you think about it, hitchhiking is a perfect metaphor for this kind of randomly predestined happenstance. Each pick-up is a roll of the dice. Factor in that like always finds like, and there’s no way these three people aren’t meeting on the road. It makes for too good of a story, and Fate loves a good story. Vera is right to hold Roberts’ feet to the fire. He’s no innocent victim of circumstance, it doesn’t take much deliberation for him to do the wrong thing. Tom Neal would suffer his own turn of fate some time after Detour and go to jail for six years for the manslaughter of his wife. A sad but fitting noir end for a noir...well, not hero. Nor antihero. If anyone really roots for Roberts, it’s because Vera is so nasty. Tom Neal is all square-jawed nervousness, and competent enough in the role, but he’s eaten alive by Ann Savage, whose motor-mouthed opportunist dominates every scene from the moment Roberts spots her on the side of the road. While he’s no typical hero, she’s also not really our expected femme fatale. For one, she’s far more of an active participant, forcing action rather than needing to manipulate it with her sexuality. When she does try to seduce Roberts, it’s not as confident as one would expect from a Rita Hayworth or an Ava Gardner; in fact, Roberts’ voiceover lays it out from the start, her looks are not that of a movie star. Savage being an atypical starlet allows for Vera to have a surprising vulnerability, one the actress has the chops to exploit. Vera also has a fate she can’t outrun: a case of consumption that will likely kill her. That is, if some other terrible calamity doesn’t claim her first. Edgar G. Ulmer is infamous for his down and dirty productions. As explained in the supplementary documentary Edgar G. Ulmer: The Man Off-Screen, the Austrian director was exiled to Poverty Row, where he established his own bluntly lyrical style as he jumped from genre to genre, shooting pictures under impossible deadlines and even more impossible budgets. Accounts vary as to whether he wanted to work the cheapies to avoid studio interference or if he was left out of big-budget Hollywood after his own noir-worthy bad decision, marrying the boss’ girl. Ulmer himself was a self-mythologizer. The filmmakers share audio from the man’s interviews with Peter Bogdanovich, which they then compare to known facts--often finding that Ulmer’s own legend is far more interesting. Detour is a perfect example of what an industrious artist can do on a shoestring. It was shot primarily on two sets: the apartment that Roberts and Vera share in Los Angeles and the car. 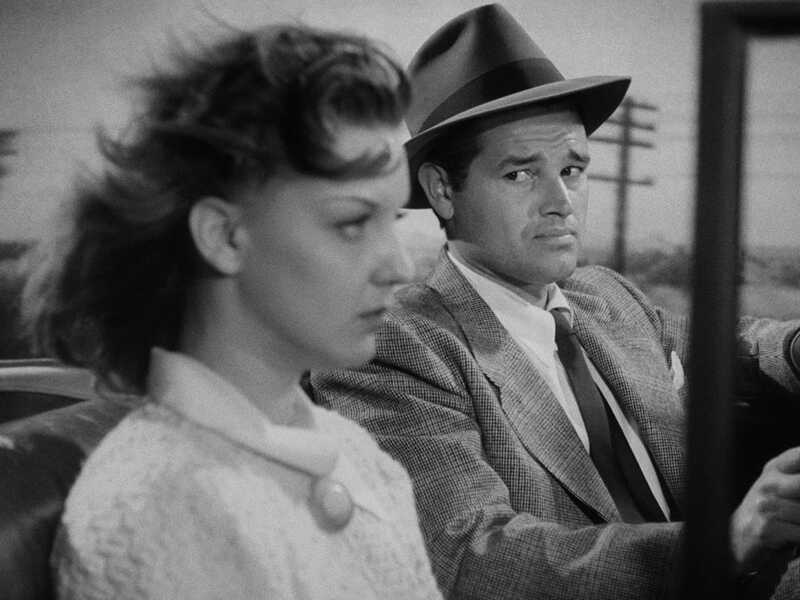 At least half the movie is in the car, which itself was set up in a Hollywood studio, the only traveling being done by whatever camera crew shot the footage for Detour’s rear projection. Ulmer manages to keep the feeling of confinement intentional. This pair is forever linked. Even as they cover miles of highway, even if Vera finally relents, they can’t escape each other. Nor can they escape Fate. The transcendence of Detour from forgettable to classic is down to how unrelenting it is. There is no ray of hope. 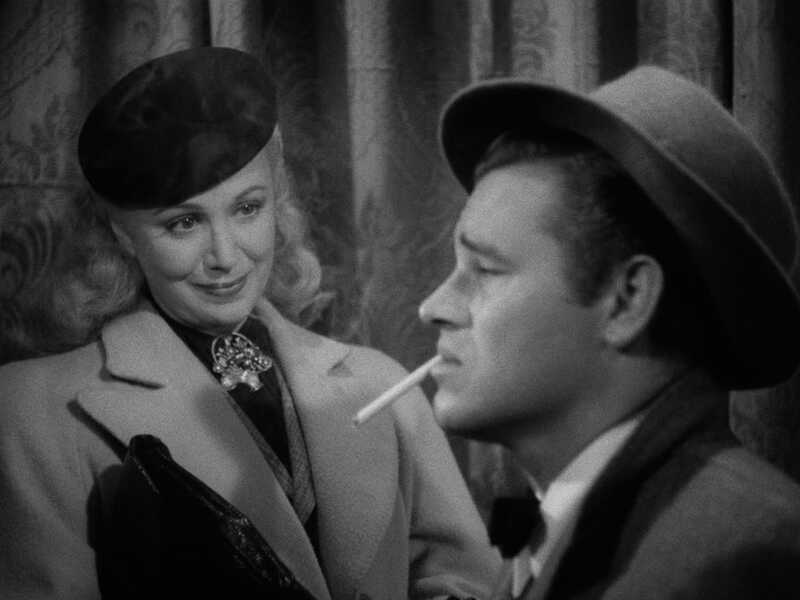 Not even the girlfriend, who in other noirs might be the earthy blonde who offers some kind of respite from the dark underworld; here, she represents temptation, jealousy, and the unattainable. Not to mention our own knowledge about how old Hollywood operated means we fill in some blanks about what we think is really going on with her out on the West Coast. For Roberts, the more he tries to dig himself out of this trap, the more he becomes entangled. 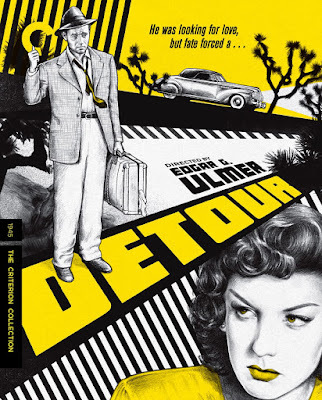 So it is that the second accidental death in Detour is so grisly--but not entirely unexpected, almost like he’s manifested his murderous desires through sheer will. And so it is that we find Roberts at a point where he’s already surrendered, reliving the tale for what might be the first time or the millionth, depending on who you are and when you are hearing it. His punishment is to be a part of this movie, and our reward is to be able to watch it again and again and again.